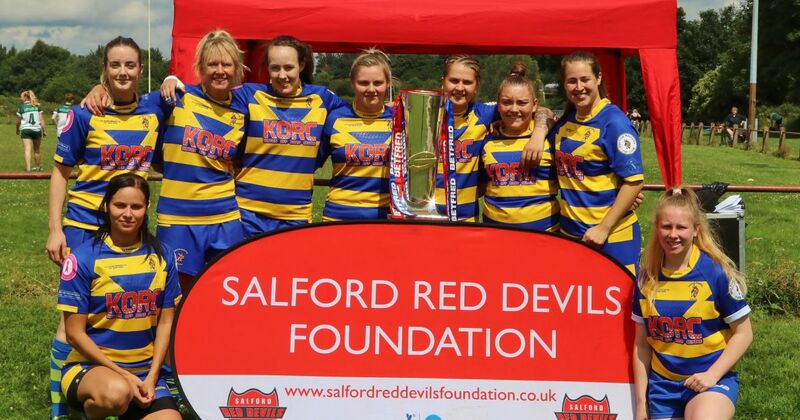 On Sunday the 9th of July the Salford Red Devils Foundation hosted the first ladies rugby league festival. On Sunday the 9th of July the Salford Red Devils Foundation hosted the first ladies rugby league festival. Temperatures hitting a scortching 25 Degrees the heat didnt put the ladies off. Seven teams were in attendance including our local Ladies team Langworthy Reds, other teams came from as far as Nottingham and Hull. Group one saw an early lead from Oulton Raidettes A team. The ladies coming out top of their group, Nottingham outlaws gave them a run for their money as well as our local Langworthy Ladies but they were too stron and Oulton went through to the final. In group B Eccles Ladies came out on top winning their first fixture but Hull Wyke were toom strong and steamed right through tp the final after a tense match against Brighouse. The games kicked off at 12pm and the festival ran till around 2pm giving the ladies enough time to get changed and head over to the AJ Bell stadium for the Salford Red Devils versus Leeds Rhinos Super League fixture. Well done and thanks you to all of the teams who attended.